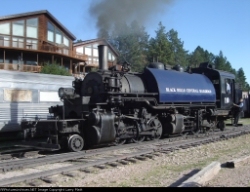 Welcome to Larry Platt's Railroad Picture Archives! Welcome to the RRPictureArchives.NET contributor site of Larry Platt. I am the Chairperson for the State of Arizona Captive Caboose List. Pictures of cabooses on display in Arizona can be seen in the Arizona Captive Caboose List Album listed at the right. I am not a member of ARCHES, I am not affiliated with ARCHES in any way, and my RRpicturearchives site is not part of or sponsored by ARCHES. I do feel it is a good organization with a worthwhile purpose. There are other albums of train pictures on my site also. I hope you find something you can enjoy.